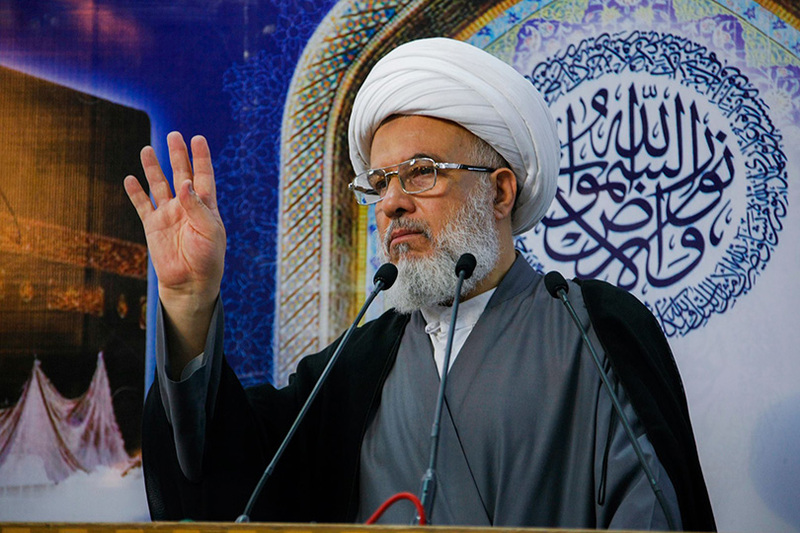 On July 27, 2018, Sheikh Abdul-Mahdi Al-Karbalai announced in the second sermon of the Friday prayer in Al-Hussein holy shrine, the position of the supreme religious authority in Najaf, represented by Ayatollah Ali Al-Sistani, about the political situation and the marathon of the formation of the new Iraqi government, in the shadow of angry popular protests in the cities of central and southern Iraq for several weeks ago. “Grand Ayatollah Sistani” position has a broad popular support, because it touched many people’s needs and their aspirations after the elections of May in the same year. But of he was confronted a cold response from some political leaders, because it imposes difficult conditions that leaders are unable or unwilling to take. This sharp position of Ayatollah Al-Sistani invites us to ask several questions revolve around the extent of respect that the political elite in Iraq do for guidance and advice of the supreme religious authority, and the extent of the ability of the latter to impose its conditions in the negotiations of forming the next government? And the extent of its willingness to escalate the situation in the case of the absence of the adoption of its recommendations? And its position to its popular base if the government is formed according to its directives and then the government failed to address the difficult situation of the people? The relationship between the Shiite religious authority in Iraq and the political Affairs since the change of the Baath regime in 2003 to the present time can not be isolated from the ambiguous relationship between religion and state in Iraq. The nature of the Iraqi regime and and its laws in force are all secular and urbanized. There is no popular or official desire to abandon this orientation, On the other hand, sovereignty and the active role in the political space of religious parties has lack ideological cohesion in their discourse and practice, and incapable of presenting a vision of state-building on contemporary civil religious grounds. Therefore, it remained abhorrent to the secular context of the state with its apparent or hidden boredom, And allied with parties and forces completely contrary to the general thought and vision of state building and managing it, which indicates the existence of a major moral imbalance within the Iraqi political parties and forces, which make their alliances and behavior and decisions are governed by the motives of access to power. On the other hand, the Iraqi people are not willing to build a theocratic state governed by religious scholars, however Iraqis regards them as a responsible when politicians fail to meet their needs and ambitions, oblivious to the fact that religious scholars when their ambition and vision are not going to hold the actual power of the state administration (As in the case of Ayatollah Al- Sistani) and their authority is limited to the moral aspect associated with preaching, guidance and advice, leaving the choice to the people to take their opinion or not. This popular opinion of religious scholars reflects a deep imbalance in the cultural structure of the Iraqi people, refers to it’s political immaturity to accommodate the moral and behavioral requirements of living in a modern state, and his dependency and blame others for his or his rulers mistakes, Therefore, there is a clear confusion and lack of understanding of the positions issued by the religious scholars based on their choices as a citizens of the state, and the jurisprudential rulings issued by them as religious scholars. The choices of religious scholar as a citizen are not infallible from error or misjudgment, but as long as they are taken in a human environment full of whims and desires, they are often exposed to that inevitably. As for the jurisprudential rulings issued by him as a scholar, which he derive it from the sources of applicable religious legislation have another matter. It requires him (by virtue of jurisdiction) to match them as fully as possible with the provisions of the sacred law. Because it is the result of his own diligence not subject to external influences, and any error is unpalatable, because it may leave very serious consequences associated with the aspect of worship in the people’s lives. This thorny situation in which the religious authority moves in let it in an unthinkable position. Iraqi politicians are divided in appreciate and respect Ayatollah Sistani instructions among politicians who do not care much about the Ayatollah Sistani discourse, such as Sunni and Kurdish politicians, and politicians who openly profess loyalty to him as some Shiite politicians, but leave his advice when their interests harm the acquisition of power and influence. Few politicians who are fully committed to what they say, while they are far too weak to control the course of the political process. As well as the Iraqi street is also at a critical period of frenzy and ideological instability tends to momentum of social mobility in the gradual move away from religiosity as a reaction caused by the poor performance of religious parties in the past 15 years, and this case is without doubt reminds us by the state of aversion experienced by the Iraqi street of national thought after the disappointments and disasters that have been resolved under the rule of national parties. On the external level, the supreme religious authority in Najaf is subjected to great pressure from two aspects: The first is linked to the struggle of influence resulting from the = rivalry between them and the absolute clerical rule of the Islamic Republic of Iran, and the other is from regional and international powers that do not care much about the, the supreme religious authority in Najaf, as much as their interests in Iraq, and who will be the Iraqi party guarantor of these interests. So, the supreme religious authority in Najaf is not fully free hand to impose its conditions inside and outside Iraq, but that will not relieve it from facing the challenges and difficulties associated with the issue of forming the next Iraqi government, and meet the popular demands, how? If the next government does not form with the conditions set by the Grand Ayatollah Sistani, the latter will have a clear moral obligation to pursue a higher level of escalation with the political elite, to confront all the popular leadership options, to counter the influence of Iraqi political forces and the pressure of international interests, Failure to do so will greatly harm his popularity and spiritual standing among Iraqis. But if the political forces, in one way or another, follow his conditions and form the next Iraqi government as Grand Ayatollah want, then, it is not expected that next government will be able to meet the demands of the people quickly. The problems of Iraq are mostly related to the accumulation of demolitions in the Iraqi state for decades It’s easy to handle demolition in construction, but the worst is that the demolition included the human, the Iraqi frustrated, emotionally unstable, suffers loss of confidence in everything, lacks a lot of skills, and educational, health and functional institutions, all do not support the treatment of this demolition, it needs a comprehensive development plan, which current policymakers and their surrounding environment does not seem to be helping to adopt. As well as high rates of public corruption, population growth, poverty, unemployment, crime, drug abuse, social militarization, confusion of the state’s legal system, external interference, infrastructure retreat and many others. All this will make the next government slow to work, and this would arouse the frenzy people whos thirsty for quick results on the ground, and if not touch these results will pour anger on the government and its symbols, and also on the supreme religious authority in Najaf because of its unsuccessful recipe of saving the situation, as people believes. Indeed, it is an embarrassing dilemma for the supreme religious authority in Najaf, which cannot escape from it only by firm and strong insistence on its stated positions regarding the formation of the next government, and be ready to move to the highest level of escalation when not responding to it’s conditions that it has set. But if the next government will form according to its vision and conditions, then, what is required is the full pressure on the government to start with the hot documents that exciting the Iraqi street, headed by the file of the punishing of the senior corrupted and throwing them at jail, and the file of the illegal presence of armed militias outside the control of the state and the file of cancel the unjustified privileges of officials, and the file of creation of job opportunities for youth through activating investment in the public and private sectors, particularly in agriculture and industry fields. As well as the file of enhancing the law enforcement and judicial independence, and addressing the humanitarian situation of the displaced and the poorest classes of the people, and all this under a comprehensive strategic plan for the administration of the state in Iraq. Starting with the largest files will calm down the angry street, and will let it busy for an appropriate period to follow the course, and that will allow the angry street to restore rationality in his demands, waiting the results of the government program on the ground in a way that serving the interests of the general public, and restore the shaky confidence between the government and the people. This course will ultimately preserve the great spiritual status of Najaf’s supreme religious authority among people, but failure to do so would be a very bad scenario, as it will have serious consequences for the urgent role of the Najaf’s supreme religious authority and its future, not only in Iraq, but perhaps throughout the world’s Shiite community.